The Shuttle Landing Facility at Kennedy Space Center, one of the largest runways ever built, will be converted to a commercial spaceport operated by the state of Florida. CAPE CANAVERAL, Fla. — The famous seaside space shuttle runway here at NASA's Kennedy Space Center may have a second life soon as a launch and landing spot for a whole new type of space mission: tourist flights. 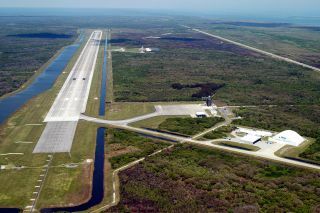 The 15,000-foot-long (4,600 meters) Shuttle Landing Facility (SLF) has been unused for spaceflights since the 30-year space shuttle program retired in 2011. But now NASA is handing over operation of the facility to Space Florida, the aerospace economic development agency for the state of Florida, to put the runway to new uses. Space Florida hopes to recruit commercial space companies to perform launches and landings from the Shuttle Landing Facility. The organization has reached out to suborbital launch company XCOR Aerospace, as well as orbital spaceship builders Sierra Nevada Space Systems, Boeing and Space Exploration Technologies Corp. (SpaceX), and has high hopes many of these companies will establish operations at Kennedy Space Center. "It's our job to make it a commercial entity —we're excited for the challenge," Jim Kuzma, senior vice president and chief operating officer of Space Florida, told SPACE.com. NASA itself may prove to be a customer of the facility when it starts launching its new heavy-lift rocket, the Space Launch System, and Orion spacecraft, in coming years. Under the new arrangement, NASA is no longer shouldering the everyday cost of running the Shuttle Landing Facility — Florida is — so if NASA uses the facility it will have to pay for it like any other customer. "It's exciting for Florida," Kuzma said. "We think the work force is here, the understanding of the needs of the space industry is here." Andrew Nelson, chief operating officer of XCOR Aerospace, which hopes to begin launching tourists to the edge of space on its Lynx vehicle soon, agreed. "The workforce is incredible here," he said. "There's just something in the DNA here." XCOR said it was attracted to the idea of launching flights out of Kennedy Space Center in part because the Space Coast lures so many tourists — it's about an hour's drive from the tourist Mecca of Orlando. "There are 30 million tourist visitors a year here," Nelson told SPACE.com. "A few are going to want to fly to space."